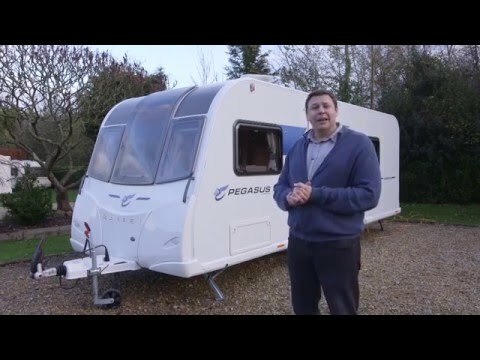 Check out the family-friendly Bailey Pegasus Ancona with Practical Caravan's Alastair Clements – watch our review! For family fun on tour without breaking the bank, check out our Bailey Pegasus Ancona review – can this end-washroom, fixed-bunk caravan hit the spot? The long-lived Pageant was a hugely important range for Bailey Caravans, the mid-market model developing a devoted following before its replacement by the Pegasus in 2009. The first van to feature Bailey’s trendsetting Alu-Tech construction system has evolved over the ensuing seven years through Pegasus II and the anniversary-special Pegasus GT65 into this, the fourth-generation Pegasus launched for the 2016 season. Two models were dropped and three new layouts added – the fixed-nearside-bed Modena, the transverse-island-bed Brindisi and the twin-axle Palermo – but one of the most intriguing vans in the range is the revised Ancona. Like the Palermo, it features a front lounge, an end washroom and a child-friendly rear bedroom, and the floorplan has been revised to right some of the shortcomings of the old GT65 Ancona. In recent years, the middle-ranking Pegasus has struggled to establish itself against the wider, highly specified and not much costlier Unicorn, but this five-berth layout gives the Pegasus a unique selling point compared with the two- and four-berth-only flagship range. With the Pegasus IV following hot on the heels of the revamped Unicorn, it’s no surprise to find that it follows the lead of the range-topper. There are the same Polar White sidewalls replacing the GT65’s dated magnolia, the same rounded rear roofline and, of course, the new Bailey family look, featuring ‘flying B’ graphics in blue. Alu-Tech kicked off the caravan construction wars and remains a logical way to build a modern tourer, with an extruded aluminium frame and sandwich panels bonded to it – the lack of external fixings reducing the risk of water ingress. It’s better looking than before, but this construction tends to give a flat-looking front and rear, softened only by ABS bumper mouldings. The full-height front window, introduced for the Pegasus GT65 in 2013, continues. Inside, the main change has been in the rear bedroom, where the fixed bunks have been moved forward, making space for a wardrobe in the full-width end washroom. Subtle revisions throughout give a sense of more internal space, despite the relatively narrow 2.23m body width. Headroom is an impressive 6ft 5in and is further aided by the adoption of perimeter LED downlighters in place of the ceiling rose. And to see more Bailey caravans for sale, click here. Manhandling the Bailey Pegasus Ancona with its sturdy grabhandles is easy, though it is pre-wired for a motor mover and it has a mover-friendly 179kg payload. It’s good to see an external 230V socket on a caravan at this price, though we’d prefer the mains hook-up to be on the offside rather than the nearside behind the door, where it could present a trip hazard. The fridge vents are also on the nearside, while the rest of the services are located on the offside, apart from the toilet cassette hatch which, thanks to Alu-Tech construction, can be sited in the rear wall. It’s great to find two external lockers with plastic liners: one on the nearside under the front sofa, the other on the offside giving access beneath the rear bunks. The standard-size corner steadies are easily reached, but the jockey wheel requires quite a bit of muscle. A step-on hitch cover aids cleaning the front of the van and the alloy wheels are fitted with anti-tamper bolts. Inside, there are plenty of specification boosts, such as uprated dual-fuel Truma Combi 6E heating and a Dometic slimline tower fridge. Even your route aboard has been well thought-out, with a sturdy grabhandle just inside the door and, above it, a simple, intuitive control panel. The Pegasus might have gained in various areas of the spec list, but nervous towers will lament that ATC trailer stability control is no longer standard on these Bailey caravans (although it was fitted to our test van). There has also been a drop from the previous-generation Pegasus’s premium-brand tyres and a wheel lock is now optional, though receivers for the Al-Ko Secure are standard, as are an AKS3004 hitch stabiliser and sensors for a tyre pressure monitoring system. Weight is down 21kg compared with the GT65 Ancona – at 1475kg, it’s light for a five-berth – and further improvements to assist towability include a centrally mounted leisure battery, under the floor, and the gas locker mounted near to the axle line to reduce the noseweight. The result is a caravan that is well within reach of MPVs, large estates and family SUVs, and feels light and stable most of the time – though it can be upset by following fuel tankers and car transporters. Here, a taller tow car helps, by pushing the airflow higher up the Bailey’s bluff nose. The Ancona’s main living area is a real highlight. Even without the additional rear dinette this would feel like a generous family space, but the option of giving the kids their own play area – or somewhere for breakfast without having to dismantle the front bed – adds to the Bailey’s flexibility. The lounge has received a thorough makeover, with taller, domestic-style curved backrests that improve the sofas’ comfort – just the place to relax and watch the TV on the sideboard beside the entrance door. There’s room for six around the lounge table. But for two people, a small pull-out table can be drawn from beneath the usefully deep front shelf, and under that there are a couple of drawers. Whatever you think of the full-height front window, you can’t argue with both the view it provides, and the amount of light coming in. A pale ‘Mendip Ash’ wood finish and three Heki rooflights keep things bright, too, aided by the standard ‘Richmond’ soft furnishings. We preferred these to the darker optional ‘Belvoir’ trim, though it does come with a neat ‘shark’s fin’ armrest for the nearside sofa. At night, roller blinds and lined curtains shut out the dark, and those curtains sit behind neat integrated pelmets. LED downlighters – including those in the leatherette front window surround – give a warm ambience. Aside from the freestanding table’s rather inconvenient location in the washroom wardrobe, our only real criticism concerns the Bailey Pegasus Ancona’s fairly narrow width, which does cause the odd clash of knees. It’s hard to fault the Ancona’s galley, particularly bearing in mind this Bailey caravan’s mid-market status. Both the 133-litre slimline ‘tower’ refrigerator (mounted on the nearside) and the top-spec Thetford Caprice cooker, with its dual-fuel hob and separate oven and grill, are items that you’d expect to find in a flagship model. Demonstrating the thought that has gone into this Pegasus revamp, the cooker unit has been moved a few inches away from the bulkhead, leaving room for panhandles on both sides of the hob – and for a small wine cupboard beneath. Under the cooker there’s a pan cupboard, and above it a standard-fit microwave – although we’d prefer it to be sited over worktop. And, talking of worktop, there is plenty of that, in pale ‘Italian Stone’ finish, thanks to the island unit that provides a visual separation between the kitchen and lounge areas. It can be extended further by raising a large flap alongside. A generous window keeps things bright. And we can’t leave this area without mentioning that full-height front window again. It gives the person standing in the kitchen the same unfettered views as those sitting in the lounge. You can also control the heating from both areas, too, with the Truma controller sited between the two. It’s not perfect, of course: there are some cold spots if you’re standing barefoot in the kitchen, and for our money the fridge would be more user-friendly if the door were mounted the other way round. The Bailey Pegasus Ancona now features a full-width end washroom, and it’s a big improvement over the preceding GT65’s. In reality, however, there’s little actual gain in floor space because much of the extra room is taken up by the wardrobe. What space there is has been put to good use, with plenty of room for changing. The vanity unit and washbasin sit in the centre of the rear wall, flanked by a small window – sadly not frosted for privacy – and the familiar Thetford C260 electric-flush swivel toilet to the left. It’s all capped by a handy shelf running over the top of the mirror, which we found was sited rather too low for comfort. The large, fully lined shower cubicle is accessed via a bi-fold door and equipped with an EcoCamel showerhead, twin LED downlighters and a full-width moulded shelf. There’s a pop-up roof vent, too. The shower is not as powerful as that in the Unicorn and the washroom took a while to warm up, with just one blown-air vent, but once up to temperature it remained toasty. Dubbed ‘DreamSleep’, the new sofa upholstery does more than add to daytime comfort. It represents a genuine advance in make-up bed design – winning Best Innovation in Practical Caravan's 2016 Tourer of the Year Awards. The sofas are long enough to be used as single beds if you’re not too tall, but to convert them into a 5ft 1in x 6ft 3in double simply pull out the slats from beneath the front chest and flip over the split seat bases to create a comfortable bed with an antibacterial outer layer. However, we found that the van had to be pitched very level to keep the slats in their runners, and finding somewhere for all of the backrests can be tricky if there are five aboard. This is a compact family van, so the terrific rear bedroom comes as something of a surprise. Open the fabric screen and you’ll find that the good-sized fixed bunks remain, each with its own window (the lower one enlarged to avoid a cave-like feel) and reading light. The upper bunk is reached by a fixed metal ladder, and there are the necessary points for a second TV in the nearside corner. However, unlike the GT65 – whose bunks ran all the way to the rear wall alongside the corner washroom, giving a claustrophobic feel – in the new Ancona the rear beds are brought into the main living space. If you have a guest, the dinette opposite can be turned into a teen-friendly 5ft 10in x 1ft 11in single – and should you need six beds, there’s the option of a fold-out bunk above. Like all caravans with a panoramic front window, the Pegasus does without the roof lockers over the front windows. Instead, there’s a pair of shelves, and two large overhead lockers on either side give plenty of capacity. Space beneath the nearside bed-box is good and can be accessed from the outside; the offside one is partly taken up by the Truma boiler. Neither has drop-down flaps to give internal access. In the kitchen, moving the fridge to the nearside frees up space for storage units. Packing in a pair of roof lockers, plus the lower ‘island’ unit with integrated cutlery drawer and a cupboard alongside. It’s a shame the curved door of the larger cupboard sports a huge handle separate from the positive push-catch, which is easily ripped away. On the nearside, the sideboard offers the perfect spot for your TV (with all relevant sockets) and a useful shelved cupboard. There’s a locker over the fridge, too, and a hatch below gives access to the consumer unit. Kids tend to bring with them vast amounts of paraphernalia, but fortunately the rear bedroom is well-served. There’s a narrow but large space beneath the bottom bunk, and a void under each dinette seat. Above it, there are two further roof lockers, and a couple of open shelves. The main wardrobe, which was in the living area in the GT65, is now in the washroom, and offers plenty of hanging space – though once it’s full, it’s hard to access the table that lives on its back wall. There’s a shelf above that’s ideal for towels, and a neat laundry basket in the base. A small cupboard below the basin will accommodate lotions. So, after running this Bailey Pegasus Ancona on the Practical Caravan long-term fleet, what's our verdict? Presuming that most families are not too concerned about having to make up a bed each night, the key priorities for touring with kids tend to be price, weight, flexibility and space. On all counts, the Pegasus scores impressively highly. Despite the affordable price-tag it has everything that most families could need, save perhaps a trailer-stability system, and the ‘three-room’ layout means that it should work well for kids and adults alike, giving each their own dedicated area. Add in a weight that brings it within reach of large family cars, plus Bailey’s most modern, attractively lit interior, and it’s no surprise that the Ancona remains among our favourite family caravans.